Sometimes I come across the most beautiful vintage pieces on Ebay...furniture finds that dreams are made of. You can find some amazing prices on Ebay and it can turn into quite a deal if you can avoid shipping costs (i.e. find something local, or at least within do-able road trip distance). 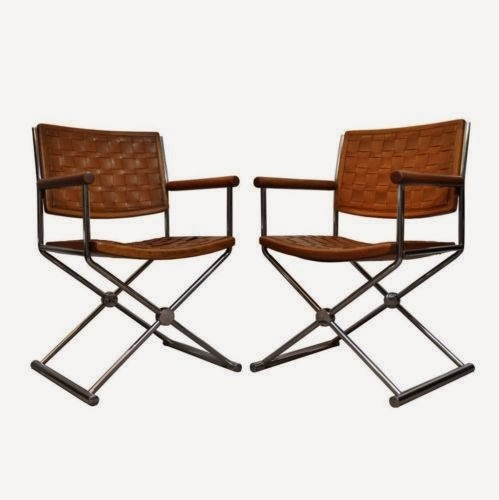 Here is my current Ebay vintage furniture obsession - a pair of midcentury modern woven leather and chrome sled chairs by Ward Bennett circa 1960s. They are in FANTASTIC condition and on sale because of a moving sale for $716 (for the pair!). I know...still steep, but almost not steep enough to be completely out of the question, especially since they're within do-able road trip distance for me. Pretty sure I could bring them to Boston and sell them for almost twice as much, too. I'll try to keep my glimmer of hope alive. Don't worry, they're not even close to falling within my budget so if you can swing it please DO because they'd be simply divine as side chairs in a living room or as dining chairs. I'd be jealous for a bit but then I'd just pat you on the back for acquiring such a score. Happy weekend!